GM Week - Day Two Review! Day two of GM Week kicked off with several GMs heading into the Rookie systems of New Eden in a game of hide and seek. The “Scavenger Hunt“ event was kept running throughout the day, and many lucky capsuleers were rewarded with the new Combat Medic Section SKIN, as well as several Well-Worn Fedoras and Retired Server Hamsters. This event will continue running throughout GM Week, so keep an eye out for a friendly neighborhood GM in local. 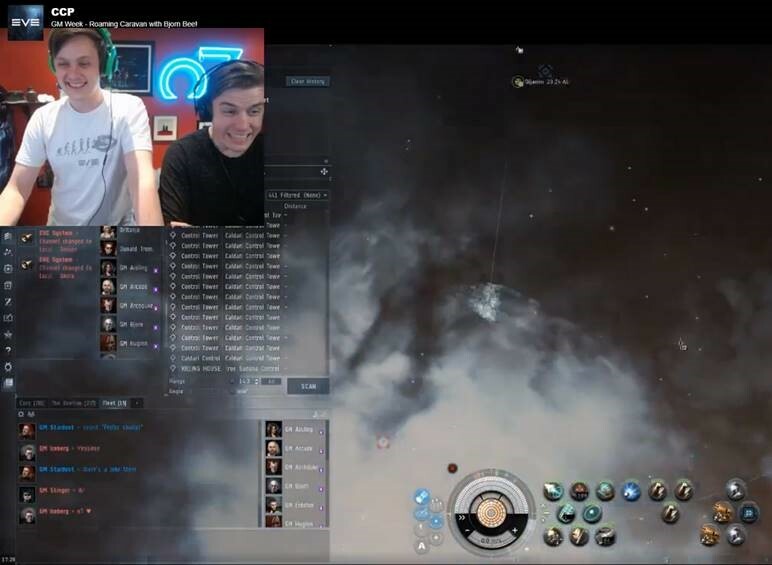 The latter part of day two saw a visit from the renowned streamer BjornBee, who arrived at CCP HQ in the hopes of leading a group of GMs on a wreck strewn patrol through the lawless wilds of New Eden. The fleet undocked and bravely set course for Geminate in search of the elusve “gudfite“. Our supreme and fantastic FC attempted to discuss tactics at one point, but quickly found that the best way to defeat one‘s enemy is through his eardrums, via poorly calibrated microphones. Sadly our opponents quickly adjusted their volume and the fight was on! Being the PVP legends we are, some of the group “scouted“ ahead without having to be told anything to that effect, and introduced the Glorious FC to proper scouting language by declaring the gate “Decent“. Several jumps and countless wrecks later the fleet was forced to admit defeat despite clearly superior fits, and took solace in the fact that it took nothing less than two Titans to bring us down! Many GFs were had in local and the GM team vowed to seek vengence the following Thursday. And now we leave you with an image that personifies that feeling you get when you know you've screwed up... poor GM Spider.